Paintings by elderly individuals in Saratoga and Washington County inspired by Marc Di Suevero sculptures on display at Salem Art Works. In early stages of Alzheimer's Disease the sculptures are interpreted very realistically and most of the page is filled with color. As the disease progress the subjects become more imaginative, color palletes more expressive and paintings cover less of the page. The Alzheimer’s Glass and Iron project first started working with Salem Art Works (a not for profit sculpture park and artist residency program) in 2013. 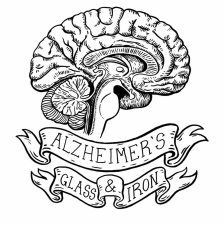 Salem Art Works strongly supports the Alzheimer’s Glass and Iron project and serves as the home base for all of the Alzheimer’s Glass and Iron projects programming. Photographs of sculptures found at Salem Art Works serves as inspiration for watercolor painting sessions with elderly who suffer from Alzheimer’s and Dementia in the Lower Adirondacks and Saratoga Springs areas. Summer 2013: Alzheimer’s Glass and Irons directors Elise Betrus and Rosemarie Oakman spent two weeks introducing the project to the area and facilitating a half a dozen iron oxide painting workshops in local nursing homes. The pair handed out paintings for metal artists to interpret into iron sculptures over the year creating their own cast iron sculptures based off the paintings. Summer 2014: In summer, 2014 Alzheimer’s Glass and Iron founder and director Rosemarie Oakman was awarded a 3 month long fellowship at Salem Art Works. Glass directors Haley Jelinek and Elise Betrus lived and worked at Salem Art Works at the same time as Independent Artists. During the three months, over two dozen art with the elderly workshops were held, in addition to a an Alzheimer’s Awareness Brunch, 3 iron pours, multiples demonstrations and days working in the glass hot shop, a series of 3 children’s memory workshops, and a gallery show that was up for a month. Over 25 iron sculptures were produced during the residency along with a half dozen glass sculptures. Summer 2015: Six artists participated in an Alzheimer’s Glass and Iron residency over a two week period at Salem Art Works. The residency took place between June 21st until July 5th 2015. Over 100 iron sculptures were designed in clay by elderly artists and cast at our Alzheimer's Iron Pour. Painting and sculpture workshops focused on the Green Mountains and Adirondack Mountains. Several glass sculptures in response to paintings were created in our glass shop. Over 100 iron sculptures were designed in clay by elderly artist an cast at our Alzheimer's Iron Pour. We also hosted a children's memory workshop and Alzheimer's Awareness Brunch open to the entire community. Michaela Bonadio, Salem Art Work's Foundry Director with his Alzheimer's Iron Sculpture. An individual with early stages of Alzheimer's rendering of a sculpture by Coral Lambert. An individual with late stages of Alzheimer's interpretation of a sculpture by Zac Ward. Paintings created by elderly individuals living with Alzheimer's Disease, inspired by sculptures found at Salem Art Works.